I made about 30 of these last night. I gave Justin the choice between chocolate or ginger cookies.. even though I knew he’d choose ginger hands down. I then remembered I had some cute little cookie cutters from halloween last year. They worked beautifully with this dough. It’s firm and doesn’t spread while baking hardly at all. Justin loved them, and even though I wanted the chocolate ones, I ended up being happy in the end. In a large bowl beat the margarine and sugar until smooth. Add in egg replacer, molasses and vinegar and set aside. In another large bowl, mix together the remaining ingredients, and combine with the margarine batter. Combine very well, it is a thick batter. If you have a stand mixer (I envy you if you do!) You’ll want to use it. If you like firmer cookies, you can refrigerate the batter for at least 30 minutes and up to 2 hours. I only cooled mine for around 15 minutes and they came out perfect for us. A little crunchy on the outside and firm but soft on the inside. Cook on 375F for about 8-10 minutes. Mix all of the ingredients together in a bowl until blended and smooth. Dip in your ginger cookies and let them set until the frosting hardens. 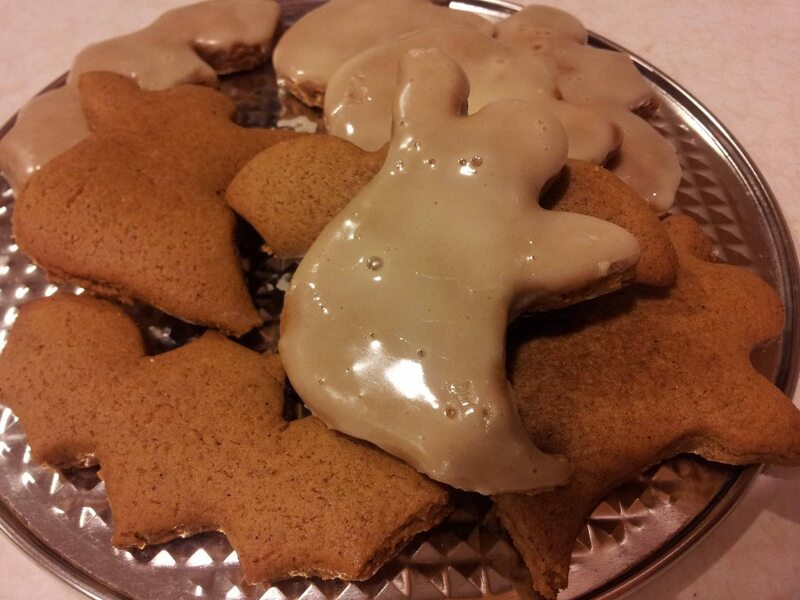 This entry was posted in Recipes and tagged apple cider vinegar, cinnamon, cloves, cookies, egg replacer, flour, ginger, halloween, molasses, nutmeg, sugar.